This is a great way to connect cameras to a DVR recorder both for the DIY and also professional installer. Video baluns and power fittings attach using just a screwdriver. 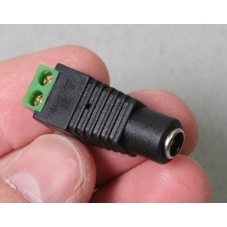 CAT5 can be used for both video signal and power supply. CCTV requires the use of very high quality pure copper Cat5e or Cat6 cable. CCA (copper clad aluminium) cable is not suitable. All the cable we supply is high quality external grade pure copper and suitable for this purpose. 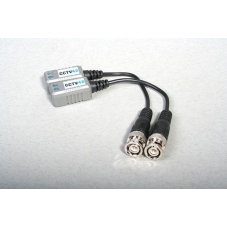 It is possible to transmit 12 volt DC power to the camera using Cat5e cable for distances of up to about 50 metres. Video transmission using Cat5e cable is possible up to around 100 metres. When using Cat5 cable to transfer both video and power use 1 cable per camera, 1 pair of wires for the video signal, 3 pairs of wires for the 12 volt power. If you are only transferring video signal then up to 4 camera feeds can be handled by a single length of Cat5. 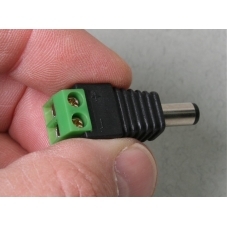 Using this method requires no more than a small flat head screwdriver as all the connections are made using screw terminals. For each camera you require a pair of video baluns (one at the camera, one at the DVR), a DC plug for the camera end and a DC socket for the power supply end. 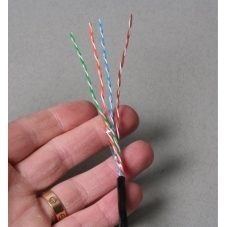 Cat5 can be easily cut to length and pulling the cable through holes or cable runs is simple.